Sulzer Mixpac USA, Inc., an innovator of 2-component adhesive dispensing systems, has announced the availability of Mixpac MixCoat™ Spray, a member of the cartridge-based 2-component dispensing system family. The portable Mixcoat Spray pneumatic dispense system is designed for small volume applications, touch-up, and repairs, including pipeline repair and field joint coating. Mixcoat Spray is an excellent choice for complex, quick-set coating structures like 100% solid polyurethanes and polyureas. It is used for offshore and water/wastewater markets, spray-on truck bed liners and sealing membranes, secondary containment for tanks, and for sealing foundations and concrete pipelines. The complete MixCoat Spray system includes cartridges containing the packaged coating material, a mixer that ensures consistent coating mix, and the pneumatic operated spray. With a lightweight, ergonomic design, the MixCoat Spray is ideal for one-handed use. Unlike other cumbersome dispense options, its dials and settings are located right on the handle, eliminating the need for additional hoses and gauges. One has the ability to use 1:1, 2:1, 3:1, and 4:1 ratios. Simply remove the plunger disk and select the correct ratio. This self-contained system requires only a pressurised air connection to operate and the integrated air flow and dual stage trigger are highly user friendly. This dual stage trigger allows atomising air to flow first to the nozzle and then to initiate material flow from the cartridge. Mixcoat Spray is also compatible with both single line and dual line flex hoses for detailed spray projects. It is the only cartridge system that can be used to spray polyureas with a flexible hose, making it possible to spray inside small spaces like man-hole applications. 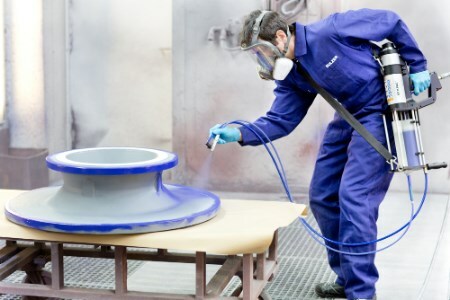 This is an ideal alternative for smaller spray projects that would normally require the use of costly dispensing equipment which need lengthy set-up and clean-up times.